With original music filled with spiritual insights and teachings, Oakland’s Reggae Angels spend most of their time on the road spreading the message. Launched in 1992 by Fenton Wardle (he and Cynthia Roots are the lead vocalists), the Reggae Angels quickly gained a reputation as both the best backing band and leaders on their own. 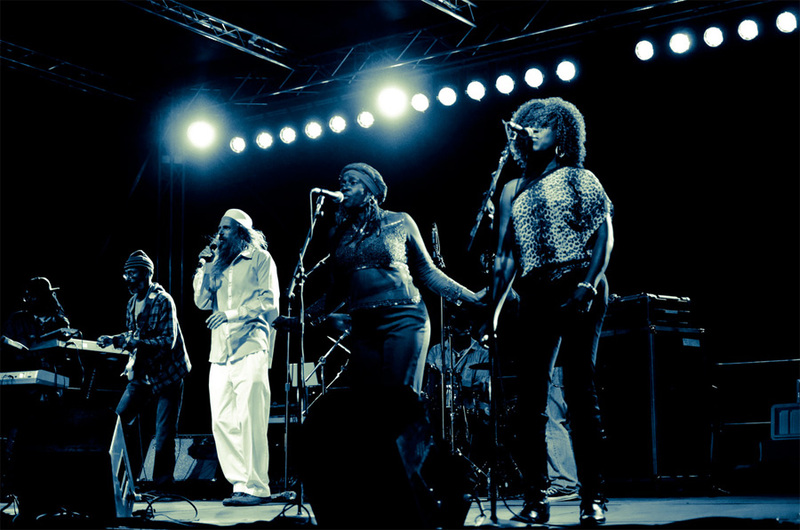 In addition to their own tours, the Reggae Angels have done a 50-city U.S. tour with Andrew Tosh and toured with and backed a who’s who of top names in reggae (Sugar Minott, Big Youth, the Abyssinians, Frankie Paul, Everton Blender, and Don Carlos, to name a few), in North and South America and Hawaii. The Reggae Angels are well-known not just for their dynamic rhythmic grooves, but also for their universal message of guidance and inspiration, with lyrics affirming wisdom, generosity, and gratitude. The Reggae Angels have their own recording studio in Oakland called The Workshop, where they help produce other artists as well as their own works. Rocker-T has maintained his youthful exuberance, energy and sound quality both onstage and off throughout his twenty seven year career through a spiritual and holistic lifestyle, and a grand love of life and music. He has been a huge influence on every music scene he has been involved in, leading the way for such artists as Matisyahu, Gentleman and Alborosie, and groups like Soja and Groundation, beginning at a time when American born artists really did not perform hip hop, roots or dancehall in a West Indian Patois. Due to his skill set he is sure to have even greater influence now and in the future. A man whose life seems to have been created for music, Rocker-T is a happy pulsating force with so much energy and love to share with the world. Berkeley’s 7th Street Band has made its name backing some of the greats and new voices of reggae and running its own studio. While 7th Street Band has been hitting the West Coast stages for a decade, drummer Edi Arnold and keyboardist Benjamin Goff, friends since high school, have played together since 1992. More recently they added guitarist Jason Collins of the Funkanauts and later rounded out the group with saxophonist Barry Capiaux and bass player Jan Isaac. 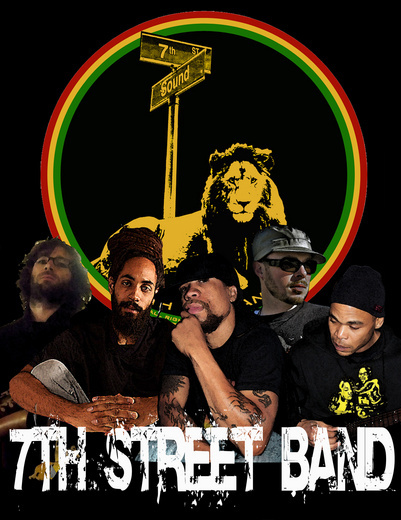 7th Street Band has been called one of the Bay Area’s best-kept musical secrets and has backed many top touring vocalists, including Konshens, Marlon Asher, Fantan Mojah, and Lloyd Brown. Other artists 7th Street has worked with include Army, Wadi Gad, Tuff Lion, Messenjah Selah, Earl Zero, Winstrong, and Luv Fyah.